Excavation and site preparation tools, QUIKRETE Walkmaker form, wheelbarrow or mixing box, shovel, level, margin trowel or finishing trowel. Materials Concrete mix or crack-resistant concrete mix, liquid cement color, plastic sheeting, polymer-modified jointing sand. A well-made walkway or garden path not only stands up to years of hard use, it enhances the natural landscape and complements a home’s exterior features. 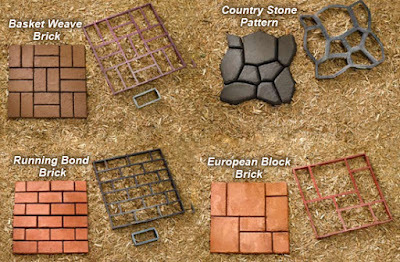 While traditional walkway materials like brick and stone have always been prized for both appearance and durability, most varieties are quite pricey and often difficult to install. As an easy and inexpensive alternative, you can build a new concrete path using manufactured forms. The result is a beautiful pathway that combines the custom look of brick or natural stone with all the durability and economy of poured concrete. 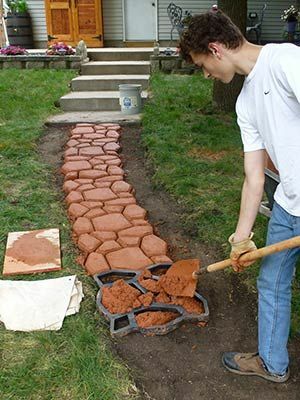 Building a path is a great do-it-yourself project. Once you’ve laid out the path, you mix the concrete, set and fill the form, then lift off the form to reveal the finished design. After a little troweling to smooth the surfaces, you’re ready to create the next section—using the same form. Simply repeat the process until the path is complete. Each form creates a section that’s approximately 2-ft. sq. using one 80-lb. bag of premixed concrete. This project shows you all the basic steps for making any length of pathway, plus special techniques for making curves, adding a custom finish, or coloring the concrete to suit your personal design. 1. Prepare the project site by leveling the ground, removing sod or soil as needed. 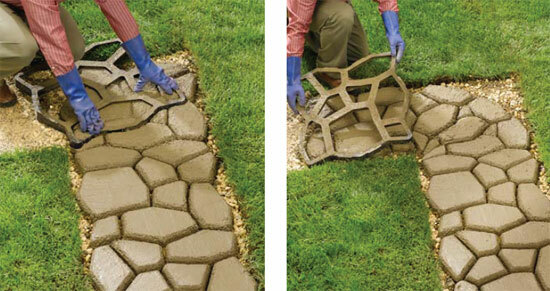 For a more durable base, excavate the area and add 2 to 4" of compactible gravel. Grade and compact the gravel layer so it is level and flat. 2. Mix a batch of concrete for the first section, following the product directions (see page 33 to add color, as we have done here). Place the form at the start of your path and level it, if desired. Shovel the wet concrete into the form to fill each cavity. Consolidate and smooth the surface of the form using a concrete margin trowel. 3. Promptly remove the form, and then trowel the edges of the section to create the desired finish (it may help to wet the trowel in water). For a nonslip surface, broom the section or brush it with a stiff brush. Place the form against the finished section and repeat steps 2 and 3 to complete the next section. Forms can be rotated to vary pattern. After removing the form from a freshly poured section, reposition the form in the direction of the curve and press down to slice off the inside corner of the section (photo left). Trowel the cut edge (and rest of the section) to finish. Pour the next section following the curve (photo right). Cut off as many sections as needed to complete the curve. Sprinkle the area around the joint or joints between pavers with polymer-modified jointing sand after the concrete has cured sufficiently so that the sand does not adhere. Sweep the product into the gap to clean the paver surfaces while filling the gap. Next, simply mist the jointing sand with clean water, taking care not to wash the sand out of the joint. Once the water dries, the polymers in the mixture will have hardened the sand to look like a mortar joint. Refresh as needed.